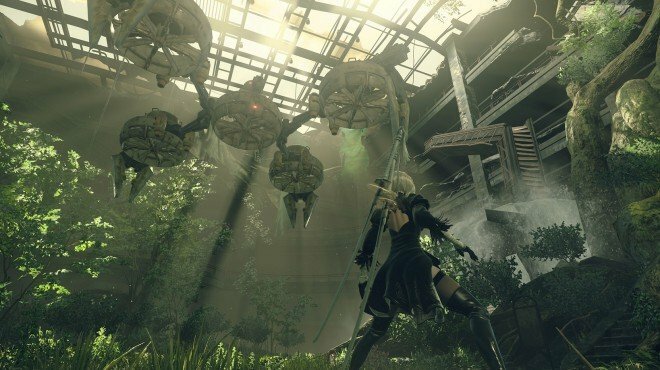 Threat Disposal is a Main Story Quest in NieR: Automata. "The multi-legged goliath reveals its controlled by a grief-striken Eve, who calls the aid of all local machines to fulfill his revenge." Remove the enemies around the barricade. Go to the center of the city ruins. After you defeat the multi-legged goliath for Weird Machines quest, Eve will emerge from within and transform the machine into yet again another enemy. Together with 9S, defeat this new enemy by using range attacks and dodging its deadly lasers. The passage to the Machine Village is blocked by several enemies. Destroy them and collect another Machine Core. Then go to the center of the City Ruins. Once you reach here, the corruption of Eve is complete and he attacks you as a boss. He has several lives, so make us of your Support Items and Enhancement Items as needed. This will lead you to one of the Endings , being A the first time and B the second.